The Octogenarian that's blooming marvellous! Unfortunately, this week will be my final blog as I am ready to move on to pastures new and will be leaving my volunteering post with Northumberland Community Voluntary Action. However, before I go I would like to thank my colleagues for their support and their patience over the past two years and for giving me back my confidence and self-belief. I would also like to thank Michelle Cadby for being a bit eccentric, for challenging me and pushing me further than I sometimes wanted to go and for being a real support. I would also like to thank all of the people who have opened up and given me their stories, every one of which has been amazing and inspiring! 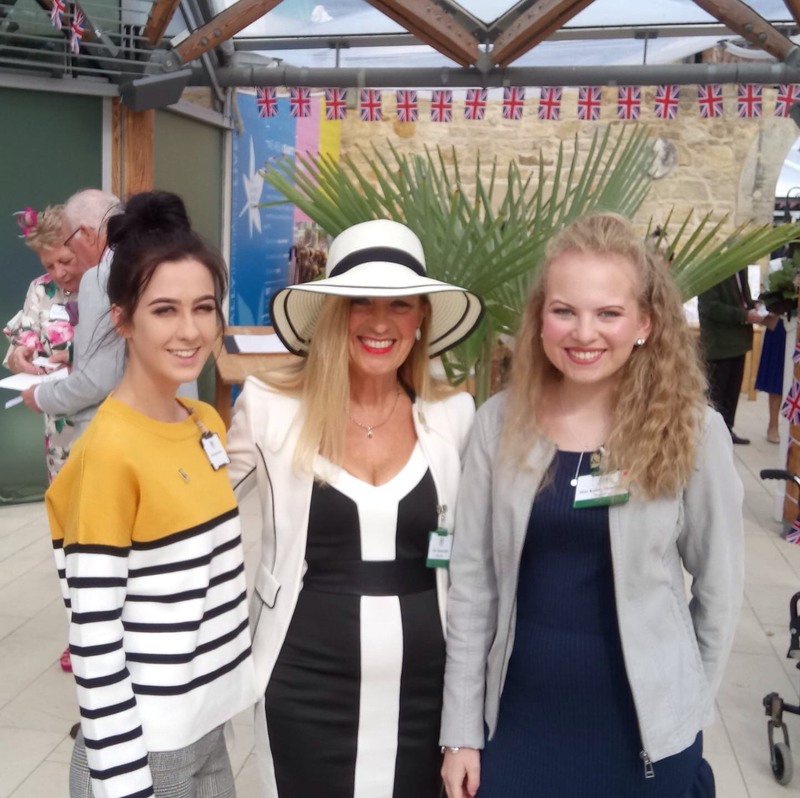 The Project is a community based initiative run by Alnwick Garden with the aim of improving the quality of life for people with dementia and their carers using a mixture of targeted therapeutic horticulture and arts activities. The programme offers older people monthly ‘clinic’ café sessions in partnership with NHS and offer a range of informative talks. Activities offered range from Keeping Active classes, including Pilates and a Walking group, to Tea dances and Foot-care sessions. There are also opportunities for a variety of arts and culture sessions including music performances, silk painting sessions and memory sessions. Drop-in sessions are available three times per week too for the over 55s to relax, chat and enjoy tea and cake and make new friends. There is also a Gentlemen's Garden (or allotment), run specifically for men who enjoy gardening and woodwork. The projects aim is to reduce isolation, increase a sense of identity and belonging as well as improve the physical and mental health of older men. Rob is 85 years young and volunteers to help people living with Alzheimers and Dementia. He believes that as he is on the mature side himself “I’m on the same wavelength when getting everyone to talk of their long term memories” including WW2 and the 1950’s and 1960’s. As he sings in a choir he also finds it natural to lead in singing many of the “old time favourites”.However, Rob doesn’t just volunteer for the one organisation, he is a very busy gentleman. In fact, he reads the Talking Newspaper for the Blind (every fortnight), acts as a host on the Arthritis Care minibus (once a month). He is Steward at the Alnwick Playhouse and a story teller for the pre-school children as part of the Playhouse Creative Cocoon programme. Rob is a retired Environmental Scientist and during his career he worked in Westminster within the Chief Scientists Group at the Admiralty. He has also worked for Ministry of Agriculture, Fish and Food as well as for the Department of the Environment. Rob originates from Surrey where both he and his wife were involved in the Brownies, the Guides, the Cubs and the Scouts, where he became the Science Badge Examiner. So volunteering is something that has been part of his life for many years. Indeed, when he originally retired and moved to Wensleydale in 1994 it appears to have been a natural move for him to help coach the juniors in the local badminton club. Whilst in the Dales Rob and his wife ran a Guest House, but they decided after the B and B became too difficult to look after to move closer to their daughter who lived in Alnwick, and more or less immediately began to volunteer here too. From singing in the choir, and having a good voice, Rob was invited to do the talking news then from his work in the poison garden at Alnwick he found it a natural progression to volunteer for the Blooming Well role after his Arthritis began to make some movements restrictive. Things develop and change, but “most times the roles just found me, as time and time again I would be approached to see if I could help” and for the most part Rob found the majority of organisations to be extremely grateful and supportive. 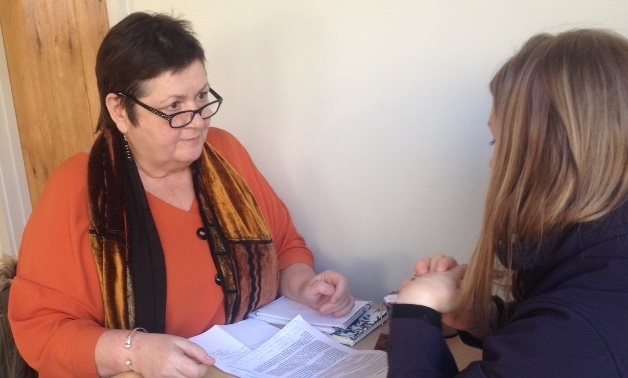 Maureen volunteers for Mind Active (MA) in a role supporting people with dementia to access a social life. The MA ethos is to support local volunteers to improve the lives of people living with debilitating conditions like dementia, who live in care homes or in their own home. Sessions are planned to improve well-being and social interaction as well as mental stimulation. The project facilitates many activities including quizzes, history talks, sing-alongs, poetry and karaoke. The client group also participate in reminiscence work, gentle movements and outdoor interests as well as many other community interactions. I met with Maureen one morning just before an activity session at the Briardale Community Centre. Describing her role she explained “it requires empathy and an understanding of the difficulties people face in the community and you need to be non-judgemental and friendly”. Indeed, she does anything to assist the team to provide a successful service or event. But specifically Maureen, welcomes guests, both the person with the condition and their carers, as well as the bereaved carers of dementia sufferers. “I engage in conversation with them and listen to what they have to say, and try to put them at their ease”. She believes understanding their loneliness and isolation “makes a huge difference”. However, Maureen does very practical things to help too, such as making and serving drinks, setting up and serving food, clearing away and washing dishes. “I encourage people to join in with the entertainment, making sure they are happy, safe and comfortable.” Furthermore, she really enjoys working alongside the young students “providing some mentoring where needed” and raises awareness of the project using social media. Maureen has attended Planning and Trustee meetings, where she has learnt about fund raising sources, in fact she participates in many of the fundraising events herself. Maureen spreads her volunteering time between Mind Active at Briardale Blyth and The Salvation Army building in Bedlington “doing a very similar job but with a slightly different group of people.” Spending between 4 and 6 days per month working between them both, although she does do more “if there are any trips out arranged, or parties to attend!” She feels that volunteers need to show the client group that nothing they do is abnormal, but at the same time acknowledge that partners of people with dementia have needs too. So, for that reason people need to show they are ‘genuine’ people, willing to take a risk. For example,” I know it’s not easy to get up and start singing or dancing in front of total strangers that’s why I have to demonstrate that I’m a bit shy too, but willing to get up and dance anyway! The early part of Maureens career was insurance and finance based giving her an organisational background and a sound understanding of administration. However, she spent the last 10 years of employment working in a more person centred but totally different environment, within the elderly care sector, which gave her a good insight into the needs of people with dementia. “I was widowed 7 years ago and retired 18 months ago. But, after I retired I wanted to continue to be useful in the community and have a purpose in life. I also wanted to keep some structure to my life” and “offer the skills I had, whilst giving me a chance to socialise and continue to build new relationships”. Skills from both of Maureens previous jobs have helped her in her current role, although she emphasised that previous training isn’t necessarily required. Undeniably, she admits, due to the underlying condition, that some situations or personalities may come across as quite challenging. But, she feels these situations are manageable because “the secret is to find ways round the issue using distraction techniques.” Maureen passes on this knowledge and reassures the students she mentors so they’re not startled by any unexpected behaviours. 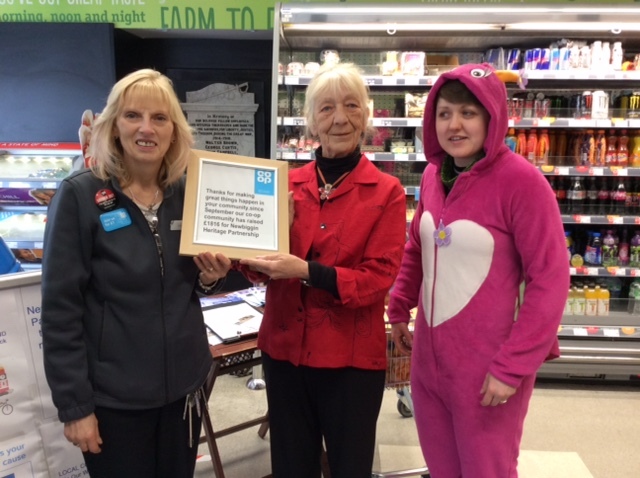 Although she hasn’t attended any so far, there have been opportunities for Maureen to attend further training with MA, and the project also offers other benefits such as a volunteers petrol allowance and “you can get a bite to eat whilst you’re here”. Maureen recently began thinking about the administration side of things “because an awful lot goes on behind the scenes to give people this service” In fact, she has attended a Trustee meeting to understand better, how the organisation functions and how it supports itself financially, and hopes to develop her role in that direction. On the other hand, If Maureens story has inspired you to volunteer more generally, but you’re unsure how to, please visit Northumberland CVA’s Volunteer Connect database http://www.northumberlandcva.org.uk/volunteering/volunteers to start exploring all of our many other opportunities. 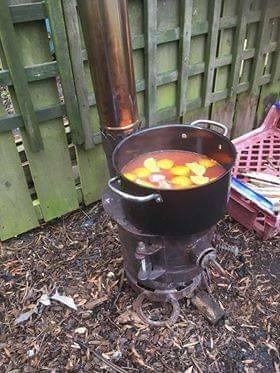 A Cook in the Shed? I recently went to meet an amazing volunteer who has suffered a great deal of personal tragedy, but who, when it comes to overcoming challenges in her volunteering role, is a remarkably resilient and versatile individual. 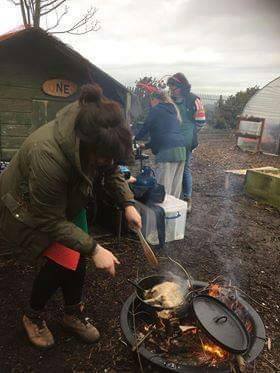 Justine volunteers for the Full Circle Food Project, a charity that educates people living in Northumberland about growing food to eat, healthy cooking on a budget and supporting people to lead healthier lifestyles. 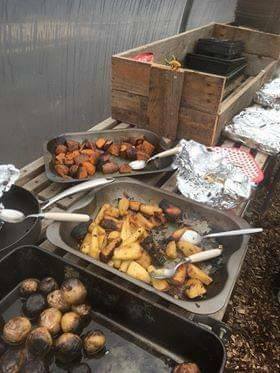 She volunteers at the projects Ashington allotment every Thursday, cooking up tasty meals for other volunteers and staff. 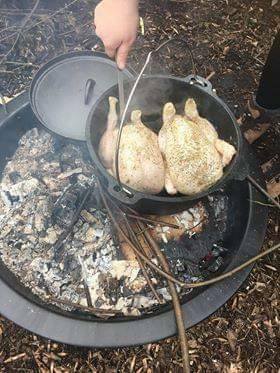 Justine laughingly told me “basically, I cook in a shed!” But, she says “we have lots of fun and I absolutely love doing it”. Describing herself as “the one pot wonder woman!” Justine has proven again and again that she can actually make anything in the one pot. 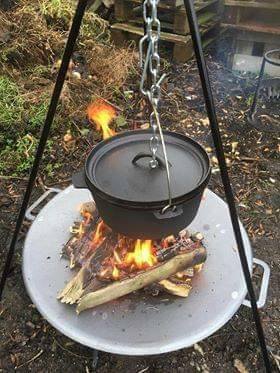 She recently got to cook using a “brand new” Dutch Oven, cooking fresh, home grown produce directly from the allotment. Accessing some of her recipes from the internet, Justine has learned to be quite inventive too creating some unique but very tasty recipes, such as “pickled beetroot with cinnamon” anyone? Justine has been volunteering for “7 or 8 months now” and jokes about being “head-hunted” for her current role as allotment Chef. Although she acknowledges having a life-long interest in food and cooking, her new culinary journey began when she accompanied her ten-year-old son, to an after school club. 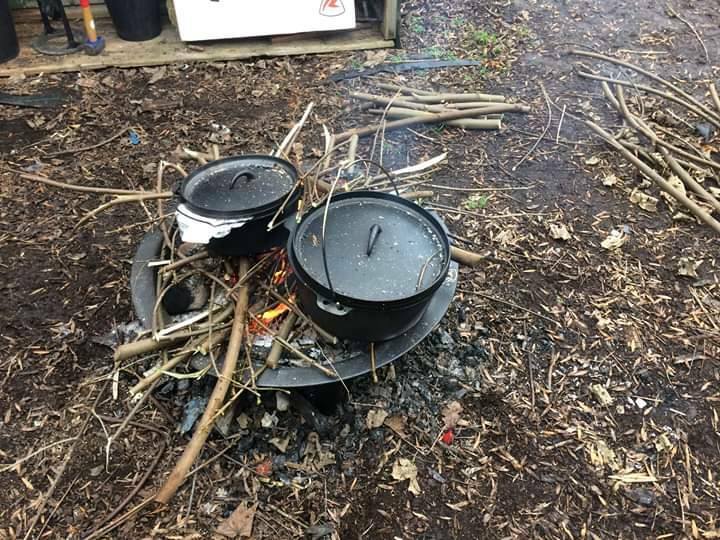 The club, run by Full Circle (and funded by Northumberland Children’s Trust) called the ’FEED ME’ project, is a 3-year programme that aims to encourage an interest in food and teach children how to cook. 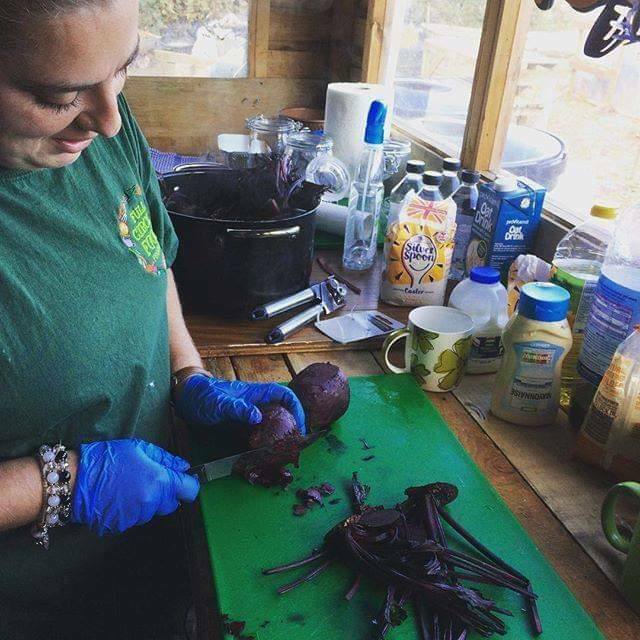 After a couple of months helping out with the class however, Justine was invited to take part in another challenge “to come over and work at the allotments!” which she quickly accepted. Sadly, Justine has been through a lot in the past few years “I lost my sister first in 2013, when she was only 13 and I thought I’d never get over it!” Then, last year not long after the death of her grandmother, her brother also died suddenly when only in his twenties. Justine says she just didn’t know how to cope and describes going through a “rollercoaster of emotions”. Her role as a volunteer, she says has helped her “turn off from my thoughts and everything, it helps me relax… worry less.” It appears that her role also gives Justine time to forget and time to reflect, helping her cope with her loss and associated mental health issues. “It takes me out of myself, if I didn’t have this I would just stay indoors!” Justine has a very good relationship with Jane, a project worker (PW) and feels like “I can talk to her about all of my stuff!” In addition, Justine said she is better able to deal with her thoughts and emotions thanks to a creative writing course and the support of a counsellor. 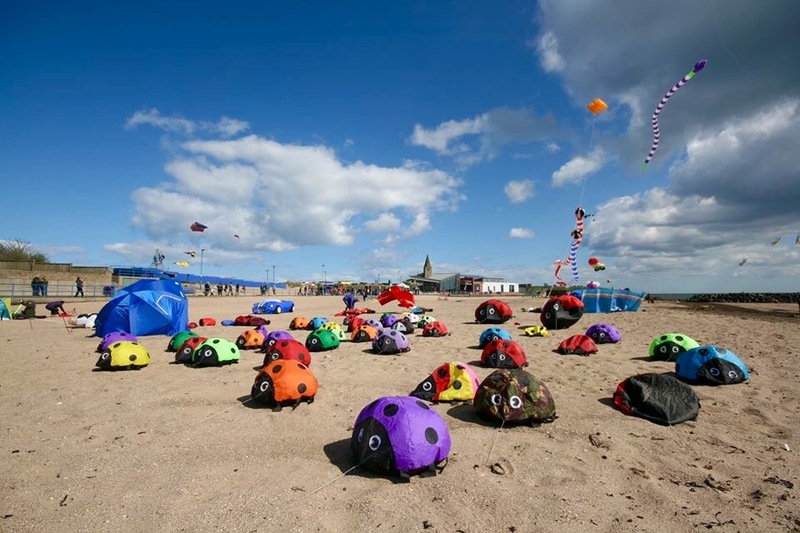 Alternatively, If Justine’s story has inspired you to volunteer more generally but you’re unsure how, please visit Northumberland CVA’s Volunteer Connect database http://www.northumberlandcva.org.uk/volunteering/volunteers to start exploring all our many opportunities. As mentioned in my previous blogs, volunteering can be quite challenging, it takes many forms and is done for a variety of reasons. So far however I haven’t touched upon Career Break volunteers. People who may be taking time out as a result of bereavement, caring responsibilities, personal or family difficulties or to study or bring up a family. I recently had the opportunity to meet Rachael, one such volunteer, who is up for a challenge and donates 1 to 2 days per week volunteering for the Northumberland Fire and Rescue Service (NFRS). Rachael does this because she is currently taking a break from employment to look after her 3 small children. At NFRS her role (based at West Hartford HQ) is mostly office based and involves coordinating what are called ‘Safe and Wellbeing Visits’ (SWV). Referrals for this programme come from a variety of sources including Police, Fire Service, Care managers or concerned family and neighbours. Alternatively, people can also self-refer and concerns are generally in relation to vulnerable adults, such as those with dementia or mental health issues, or “people who put themselves at risk through their own behaviour, such as hoarding for example”. Basically, Rachael identifies who the occupier is and either rings them, using tact, diplomacy and her own personal skills to assess their needs, or she contacts the care manager to arrange for a team to go out and complete a home visit. Very often these visits are to give advice to the occupants or fit devices such as smoke alarms. Rachael herself has been out in the community assisting with these home visits and feels that they gave her some context and a greater understanding of the issues. Rachael originally hails from New Zealand and after graduating from the University of Otago worked as a personnel administrator at the New Zealand Fire Service in the Wellington area (quite remarkably this region has a total of eight stations just in the one geographical area!) During this time Rachael gained an understanding of the roles involved and the organisational structure of an emergency service. Following this Rachael lived in Australia working for a recruitment agency in Melbourne and subsequently worked as a Nanny in Sydney, before settling down and starting her family. In 2017 Rachael and her husband re-located to Northumberland, and after a while, with her children settled at school and some extra time on her hands, Rachael began to feel it was time to take on board another challenge. “I wanted to find a volunteering opportunity that would be flexible, rewarding and ideally give me the necessary skills and confidence for when the time comes to re-enter the workforce.” Not unlike many other parents who have had a career break to look after family, Rachael worried about the gap in her CV, the ever changing advances in technology and updating her skill set. Not surprisingly due to her previous experience within the New Zealand Fire Service, Rachael felt that our local Fire Service was the most obvious place to start. Therefore, she began looking for an opportunity in the most logical place she could think of, the NFRS website and Facebook page. Rachael explained that volunteers are very much support staff within the organisation and all volunteer roles are non-operational. Even though it’s not a guaranteed or a direct entry to becoming a Firefighter it can be a good way of getting a feel for the organisation before applying. 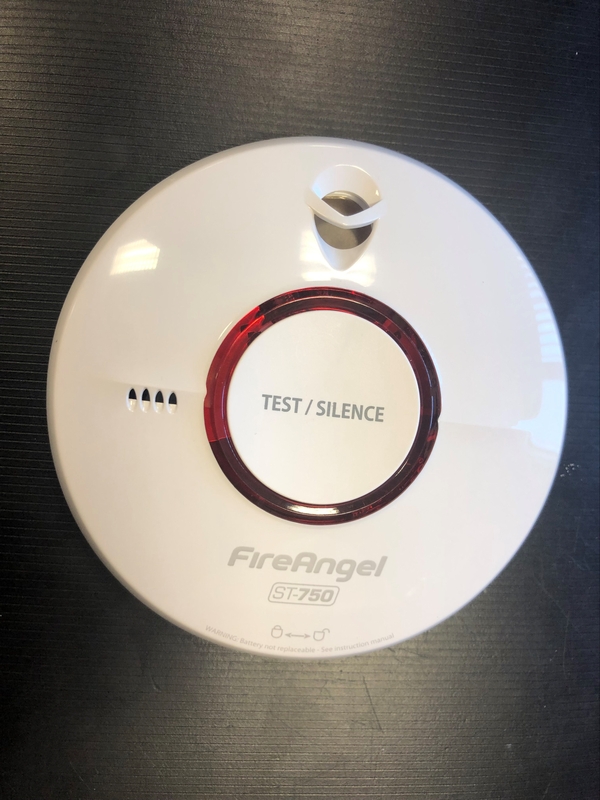 The Fire Service currently has 16 regular volunteers who support with Community Safety programmes, home fire safety checks, West Hartford’s community boxing academy and the Young Firefighters Association (YFA) programme. There are also opportunities within the organisation for business administration apprenticeships and customer service roles. During her time with NFRS Rachael has had many other experiences too, including helping the Education Coordinator with School visits including a Water Safety Education (SWSE) programme, that aims to educate youngsters about the dangers of playing in or around bodies of water. Rachael has (rather dramatically!) 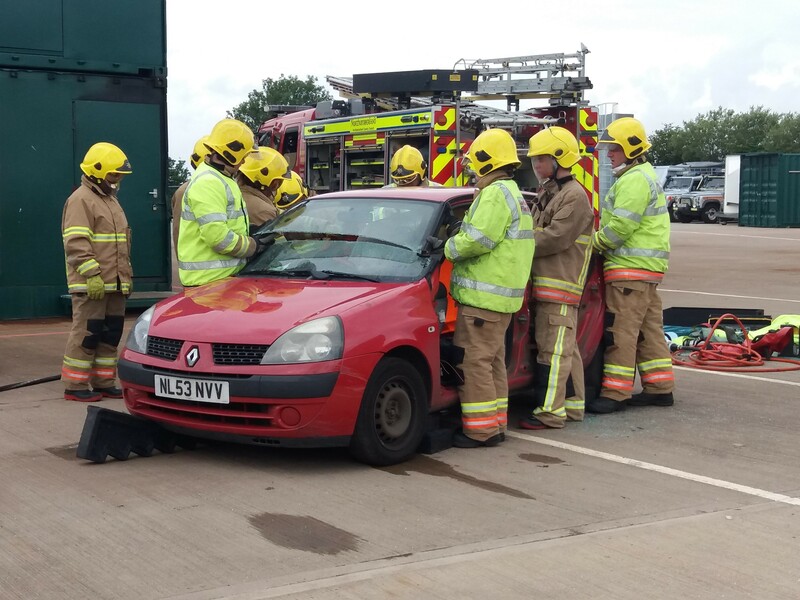 also acted as a casualty for the Learning and Development team during their Road Traffic Collision (RTC) training. Apparently, this scenario was a wake-up call for Rachael, highlighting the reality of road traffic accidents as it involved being cut out of a wrecked vehicle!! All applicants should be aware that there is a need for DBS clearance for all roles. Therefore, Rachael asks that applicants are not put off by this and please be patient as NFRS will get back to you as quickly as they can. The basic definition of the word Trust is a firm belief in the reliability, truth, or ability of someone https://en.oxforddictionaries.com/definition/trustee. Therefore, the role of a Trustee not only entails being able, reliable and truthful it also means having the power of ‘administration of property in trust’ and therefore comes with a legal obligation. So, given the responsibility of the role, how does it feel to be a volunteer as well as a trustee? What kind of people take on the challenge and what skills are required or gained from this unique experience? 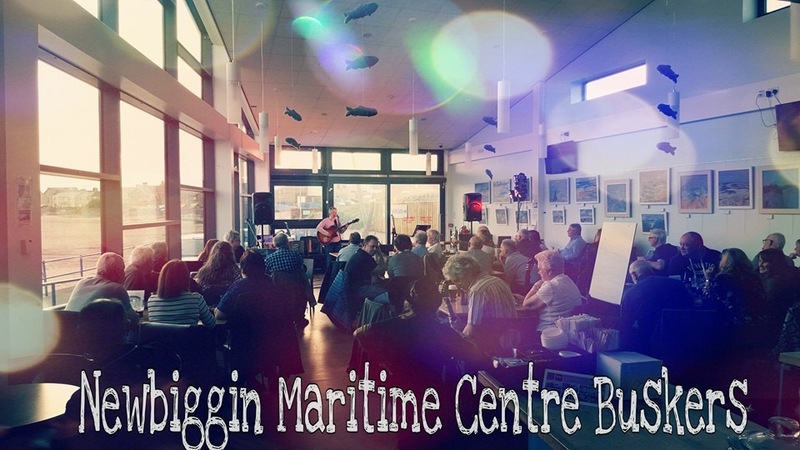 I recently had the opportunity to chat with Sheila, a Trustee for the Charity running the Newbiggin-by-the-Sea Maritime Centre, about her experiences. But to understand the background to the creation of this new Centre Sheila first expanded on some of the dramatic changes experienced by the people and the town. It appears that during the late Victorian era, Newbiggin was one of Northumberland’s favourite seaside towns, with bathing facilities and hotels, it attracted hundreds of visitors every year. Over the years however, and with the introduction of coal mining into the area, the beach gradually suffered from erosion and in the 1970s and 1980s the situation became critical. “You see the mine workings used to go under the beach and the sea but although the mines were capped, when the beams collapsed deep within the system, it created subsidence that led to the disappearance of the sand, exposing just the mud and rocks.” At around the same time the town was subjected to the same economic and social challenges faced by other derelict pit villages. In fact, the dramatic run-down in the coal mining industry in the 1980s and 1990s led to social deprivation and an air of neglect dominated the area. However, a subsequent government regeneration initiative and coastal protection scheme rebuilt the beach using half a million tonnes of sand imported from Skegness in Lincolnshire (of all places!) and became the catalyst for economic recovery. Subsequently in 2006 local organisations came together, The Mary Joicey Association, Heritage Association and the local History Group to create The Heritage Partnership. The Mary Joicey was the last offshore, all weather RNLI lifeboat to be stationed at Newbiggin and was retired, after 23 years in 1989. Unfortunately, after many years as an outdoor exhibit it was found derelict in a Berkshire park and was in grave need of some TLC. Therefore, to save this irreplaceable piece of history, the haulage company Fergusons Transport stepped in to generously transport and store the lifeboat, free of charge for approximately 3 years until it was fully restored. However, there was a problem because the original Heritage Centre, which was basically a hut, was far too small to house the boat and needed to be demolished so a much larger Maritime Centre could be built. To this end, funding was received from a number of organisations, top of which was a huge government grant called “Sea Change” that amounted to £1million. Sheila’s initial interest in becoming a Trustee first developed when she “got roped into doing the minutes for the Board meetings” and “when I worked with the Treasurer to prepare spread sheets, my interest just developed really”. She reveals that she read books about being a Trustee and attended some ‘day courses’. But mainly remembers having lots of support from a previous trustee, now deceased, who “was my rock and my teacher. He was a great friend who was a mine of information”, especially with regard to Governance. Sheila acknowledges that she has a huge duty to the Board and her priorities as a trustee are to “save public money, and to set goals and reach them”. Although she admits that her background in teaching Maths helped with some of her duties, it isn’t necessary to have a specific ability, because as a trustee “it’s about common sense, basic budgeting and people skills”. She does feel however that “new blood” is required as too many trustees are “getting on” in years and she feels that on a practical level it is probably people in their 40’s who are a better fit, experience wise. As a widow with a grown up son, Sheila freely admits to investing a lot of time and energy into preserving the culture and history of Newbiggin and her strong feelings about the project are self-evident when she talks about her colleagues and the Centre. 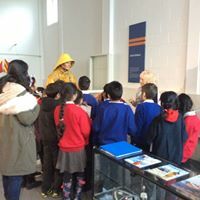 Her “other and varied” duties include “giving talks to encourage people to treasure their heritage and to donate goods, as well as donating cash to the Centre”, she visits schools and educates the children about their local history. She also has a role as a more general volunteer and will turn her hand to anything needed “including sewing bags for the gift shop!” Sheila jokingly admits that she tries to have Saturday and Sunday off! The charity runs the Maritime Centre and the Rocket House (which actually functioned until the late 1960’s) and relies on a mixture of employed staff and volunteers to provide the numerous facilities for the people of the area. There is the Breakwater Café, the Seashore Shop, a three gallery Museum and a large function room. They also organise regular events such as the annual Kite Festival, Music Gigs, Film Shows, Children's Activities and regular Art shows. 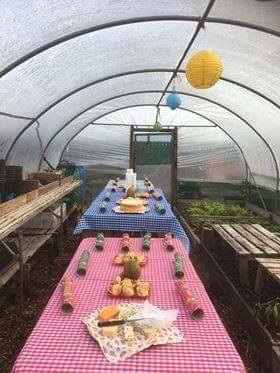 A Giant Cactus Zone Show and a textile exhibition were put on recently and Northumberland Theatre Company performed The Princess & the Goblin there. They also hold regular beach cleans which are enjoyed by everyone. 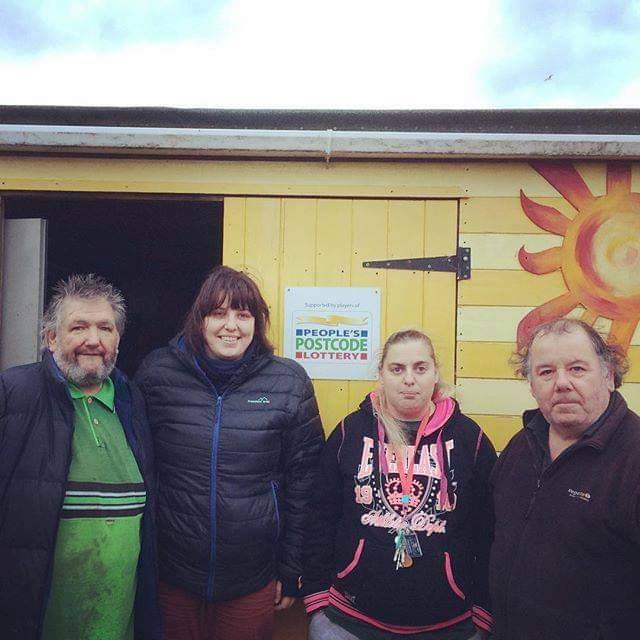 In fact, Sheila is always looking to improve facilities and is currently looking at beach accessibility issues and the possibility of making it easier for disabled people to access the whole beach area. She has even ‘borrowed’ a beach clean bill board from a national firm, so as to encourage the public to pick up rubbish whilst visiting the beach. This is particularly popular with children and encourages them to understand about wider environmental concerns and the impact of litter. 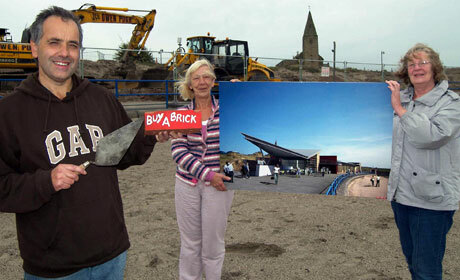 In fact, Newbiggin Beach was voted number 1 in the Proctor and Gamble leader board to win a ‘Big Beach Clean’. Sheila revealed that winning this means the beach can have a “deep clean” to get rid of all existing litter and thus make it much easier to maintain in future. Not one to sit on her laurels, Sheila continues to help in the regeneration process and through her attempts to make Newbiggen a better place to live and visit, she recently decided to run for Newbiggin Town Council, and was thrilled to be successfully elected as a local councillor!! Could you be a Link to success? The Key to Happiness? It’s fresh air and exercise shaped!